Did Thumbs Up Mean the Fallen Gladiator Didn't Have to Die? The fights between gladiators in ancient Rome were brutal. It was not like a football game (American or otherwise) where it would be assumed that both sides would go home with just a couple of bruises. 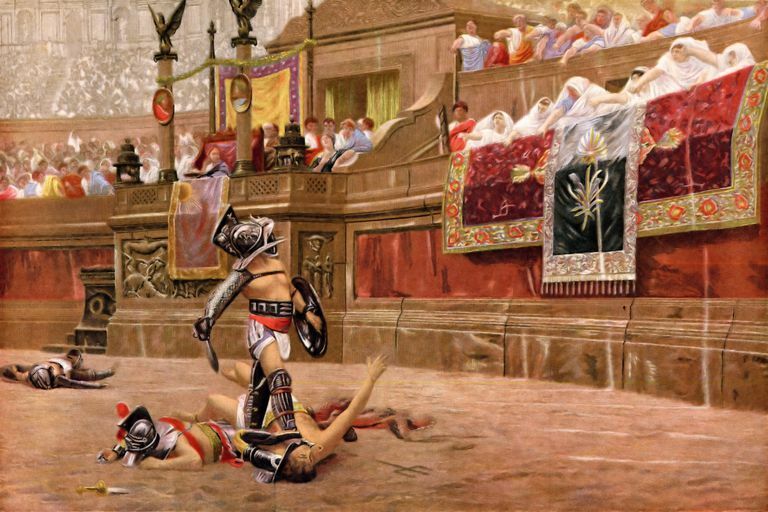 Death was a common occurrence at a gladiatorial game, but that doesn't mean it was inevitable. One gladiator might be lying prone in the blood-absorbing sand of the arena, with the other gladiator holding a sword (or whichever weapon he was assigned) at his throat. Instead of simply plunging in the weapon and consigning his opponent to death, the winning gladiator would look for a signal to tell him what to do. The editor of a game, whether senator, emperor or another politico, made the final decisions about the fates of the gladiators in the arena. However, since the games were to curry public favor, the editor had to pay attention to the wishes of the audience. Much of the audience attended such brutal events for the single purpose of witnessing the bravery of a gladiator in the face of death. If the editor made no rules for the game, the combatants could fight until the audience asked for their dismissal. It was then up to the editor to decide whether to go along with the crowd's wishes or call for a fight until "the finger." If the editor wished, he could order the fight to last until "the finger." After his weapons were cast aside, a gladiator could fall on his knees and raise his index finger to ask for mercy. Again, it was up to the editor to grant it. The editor could also choose a game without dismissal (sine remissione), where fighting lasted until one combatant died. Augustus may have forbidden this version of the game, but if so, the prohibition was short-lived. When a gladiator went down, cries of Habet, Hoc habet! (He's had it! ), and shouts of Mitte! (Let him go!) or Iugula! (Kill him!) could be heard. If able, the wounded gladiator would lay down his shield and raise his left hand to plea for mercy, which the crowd signified either by extending their thumbs up or down (pollice verso), turning the thumb upwards and jabbing it toward the heart (pollicem vertere) also was a sign of disapproval, and approval indicated by pressing the thumb and forefinger together (pollicem premere). The image shows an editor's gesture signifying that the gladiator should be killed is not exactly thumbs down, but thumbs turned. Christopher S. MacKay says the thumb motion represents the plying of a sword. The editor might also call out, "Cut his throat." In Gestures: Their Origins and Meanings, the authors examine why we falsely believe thumbs up means mercy. Death was not the inevitable result of gladiatorial combat. The famous Morituri te salutant (Those who are about to die salute you) was said once to Emperor Claudius on the occasion of a staged naval battle, not gladiatorial combat. As for thumbs up, there appears to be no evidence for it—or at least, if it was used, it probably meant death, not mercy. A waving handkerchief also signified mercy, and graffiti indicates the shouting of the words "dismissed" also worked. Honor was crucial to the gladiatorial games and the audiences expected the loser to be valiant even in death. The honorable way to die was for the losing gladiator to grasp the thigh of the victor who would then hold the loser's head or helmet and plunge a sword into his neck. Gladiator matches, like much else in Roman life, were connected with Roman religion. The gladiator component of Roman games (ludi) appears to have started at the start of the Punic Wars as part of a funeral celebration for an ex-consul [see Gladiator Profile]. To make sure the loser wasn't pretending to be dead, an attendant dressed as Mercury, the Roman god who led the newly dead to their afterlife, would touch the apparently-dead gladiator with his hot iron wand. Another attendant, dressed as Charon, another Roman god associated with the Underworld, would hit him with a mallet.